These days with the struggling economy people are looking for ways to save money. One way to cut corners is to grow your own food. It might actually be the first time you could answer questions like where was your food grown, what type of soils and fertilizers were used in its production and were any pesticides or fungicides applied to the plant material? If you love to cook, especially with fresh herbs, then you might enjoy a culinary herb garden. Nothing beats the flavor of freshly picked herbs in soups, stews, sauces, casseroles, pastas, salad and many other dishes. Here are some steps to follow to get started in the right direction. The first and most important step is picking the right location. It should be located close to the house so that you don’t have to go far to get your herbal ingredients. Six to eight hours of sun a day is ideal for any herb garden. Proper placement is necessary because once harvested the herbs may look less desirable. Second, you should always start a garden with great soil! Most culinary herbs need a well-drained, fertile soil to grow their best. Herbs like organically rich soil, so amend your beds with compost before planting. Then mulch with organic material such as shredded bark after planting. The compost provides nutrients for the plant and aids in root production. The mulch will eventually breakdown into organic matter over time. Although many herbs are drought-tolerant, moisture is needed to maintain active growth. Water herbs thoroughly and then allow the soil to dry out somewhat before watering again. 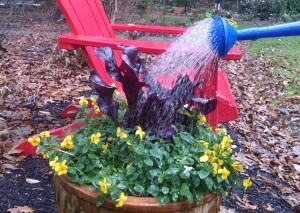 Plants should be watered early enough in the day that leaves can dry before nightfall. Some herbs, particularly most annual herbs, need additional soil moisture for best growth. Consider what kind of look you are leaning toward. Do you want a formal or informal herb garden? Formal gardens, such as knot gardens, are attractively laid out in beds with brick, gravel or paved walkways in between. Beds can have themes such as Italian or Asian herbs. 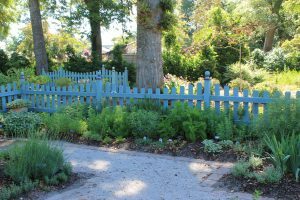 Informal herb gardens are a mix of many different types of herbs designed more like a cottage garden with plants spilling onto walkways. These informal designs are less about looks and more about production. Mix up the types of culinary herbs you’re growing with an eye for design. There are three types of herbs herbaceous, evergreen, and annual. Herbaceous herbs, such as oregano, chives, tarragon and mint, die back each winter but return in the spring. Evergreen herbs, such as rosemary and sage, stay green year round. They need spring pruning in order to control their shape. Annuals, such as, basil, cilantro and dill will die when we receive our first frost. You will need to replace these each year. Be sure when planning your garden to incorporate all three types of herbs into your design. Grow the herbs you like to use in the kitchen. If you like cooking Italian food, make sure you have plenty of basil, parsley, thyme, and rosemary. If you like Asian foods grow Thai basil, lemongrass and hot peppers. If you like Mexican cuisine, grow cilantro, or chili peppers. 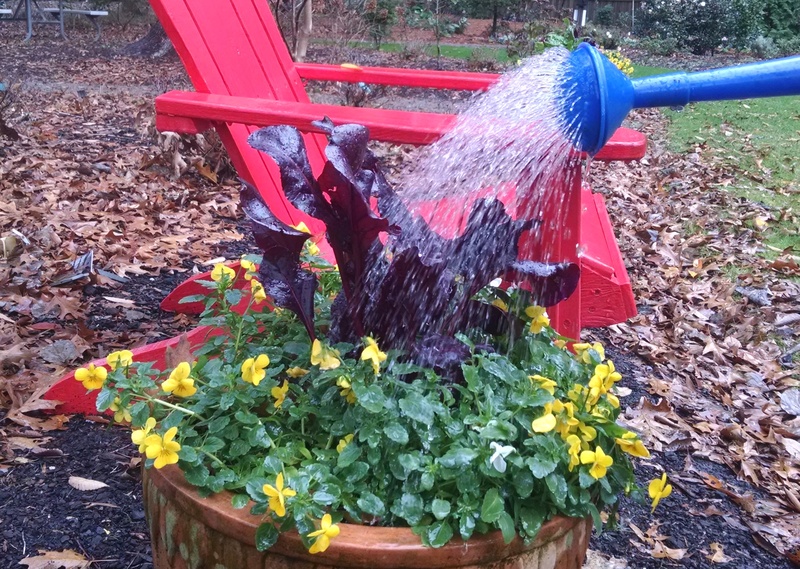 Finally, don’t be afraid to add color to your herb garden. Flowers such as pansies, violas, marigolds, geraniums and roses compliment a herb garden well. Even though it’s still early, our gardens are beginning to awaken from their short winter slumber. I’ve noticed new growth on daylilies and roses already. 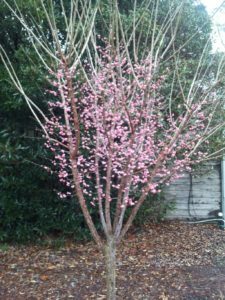 If a bit of new growth doesn’t quite chase away your winter blahs, consider adding Japanese flowering apricot to your garden. It always blooms in January and February in shades of white, pink and red. 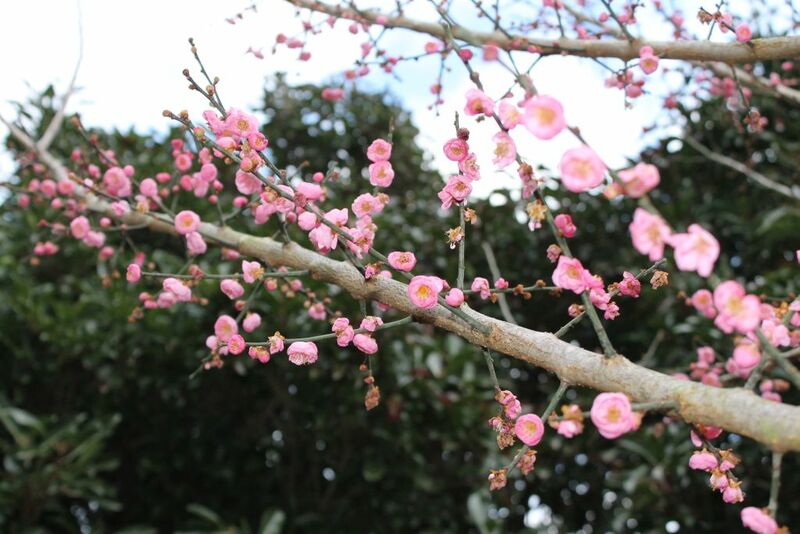 Japanese flowering apricot (Prunus mume) is similar in habit and appearance to some of the smaller flowering cherries that bloom a bit later in the season. Expect a small tree with a rounded branch structure reaching 20 feet or so. This winter wonder isn’t too fussy about soil as long as it’s well-drained. You will notice better growth and flower bud set in soils with a bit of extra organic matter; especially if your soil is very sandy. Full sun is a must for the flowering apricot. Even small amounts of shade will the reduce flower bud set. As the tree develops, lower branches are often shaded to the point that they die. 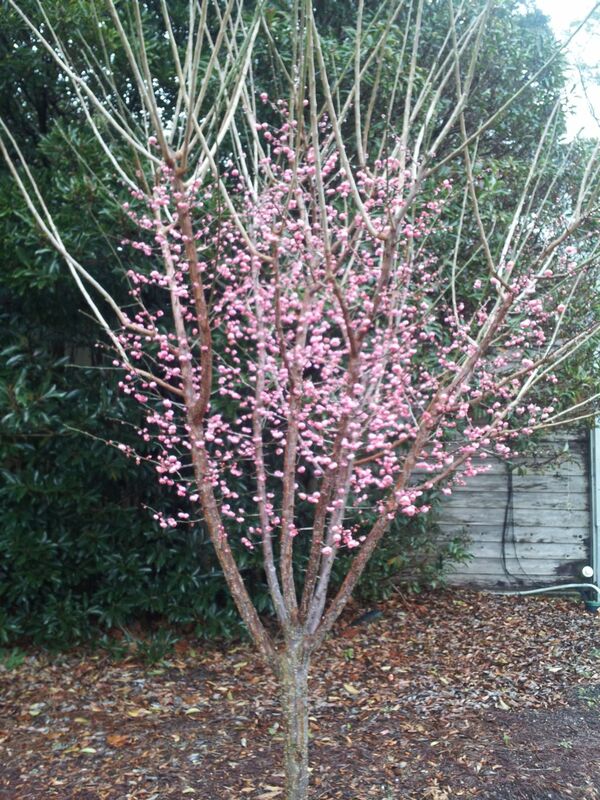 You won’t see this particular Prunus in every garden center, but it’s not impossible to find. The Japanese have been playing with this plant long enough to have more than 250 named varieties, but the choices in our neck of the woods are much smaller. ‘Peggy Clarke’ is a popular selection that bears double flowers in a deep-rose shade. ‘Kobai’ has red, semi-double flowers on a vigorous plant. Weeping selections such as ‘W.B. Clarke’ (double pink flowers) and several white-flowered forms are available. Most flowering apricots have at least some fragrance. When we talk about anything in the Prunus genus, we usually begin a long list of pest problems such as white peach scale, peachtree borer and scab. It’s not impossible to see some of these problems on flowering apricot, but healthy trees don’t usually have significant issues. Trees that are grafted on peach rootstocks may be attacked by the peachtree borer. 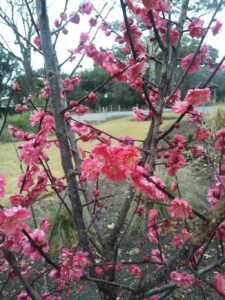 We have several specimens of flowering apricot in the Display Garden at the New Hanover County Arboretum including ‘Peggy Clarke’, ‘Kobai’, ‘Alba Plena’ and ‘Matsubura Red’. 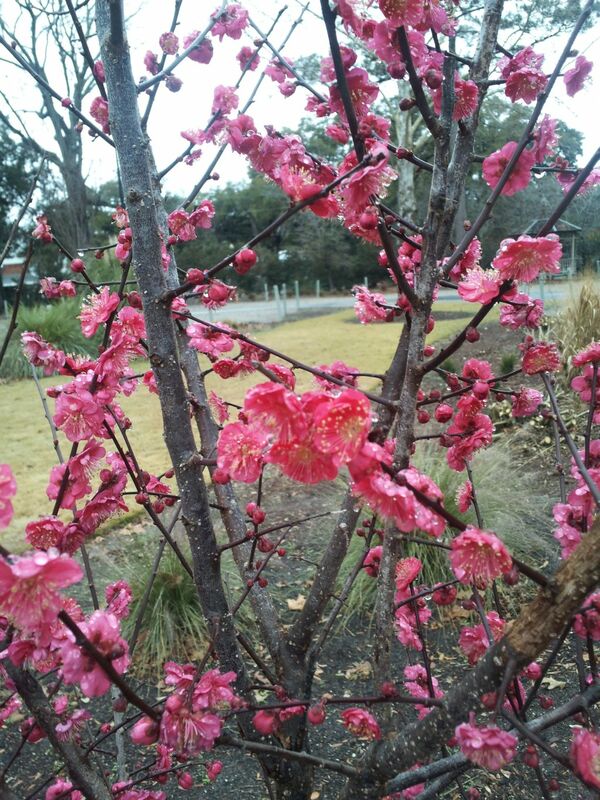 Japanese flowering apricot has never become popular because it blooms well ahead of most people’s bouts of spring fever. But, if you’re like me and always looking for something else to chase away those winter doldrums, this small tree is just right. 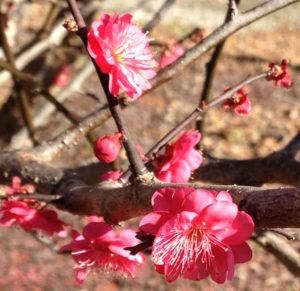 Other members of this genus that bloom just after Japanese flowering apricot are planted in the Arboretum including ‘Okame’, ‘Snowgoose’ and ‘Dreamcatcher’ flowering cherries and the hybrid plum called ‘Blireana’. Temperatures in the teens aren’t all that common (thank goodness) in southeastern North Carolina. 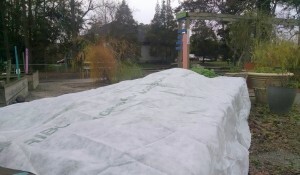 But, when we do get a cold blast, gardeners always ask about how to protect plants from low temperatures. No matter what you do there will be some injury on certain plants. Unless it’s a very mild winter oleanders and sago palms suffer. Open camellia blossoms can’t take the freeze. Exposed pittosporums – especially the dwarf and variegated selections – are often affected. So, what are our options for protecting plants against the cold? Polyester row cover material or even an old sheet will prevent ice formation on the leaves and buds but may not be enough to protect sensitive plants when temperatures plunge into the high teens. Clear plastic in sometimes recommended but make sure you support it with something to keep it from lying directly on the leaves. And, if the day warms up, remove the plastic. The greenhouse effect will get you. One thing that gets passed around every year is that you can protect your plants by spraying water on them. Like most things there’s a bit of truth to it, but anyone who believes that they can go out before they turn in for the evening and spray their plants with the garden hose and expect protection will be disappointed. As water freezes it gives up heat. This is what protects the plants – not the ice. Ice has no insulating value. For water to work it must be applied continually throughout the entire below-freezing event so that heat is continually given up as the ice forms. This is not practical for most people. And, the weight of the ice can break limbs. That’s why you don’t see this method used in tree fruits. It’s mostly strawberries and blueberries. Some people really don’t like the look of the fried leaves. If you can live with it wait until late February to remove the damaged tissue. While there’s not much you can do in that situation, avoid early pruning and nitrogen fertilization so plants don’t leave their dormant period sooner than normal. This is especially true for plants such as centipede grass that lose their dormancy very quickly—just three to four warm days. — Written By Al Hight The hybrid mahonias are one of my favorite groups of winter-flowering plants. 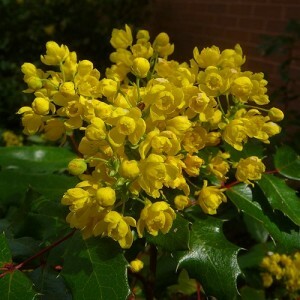 If you like the Latin they’re listed as Mahonia x media. I have two selections in my garden – Winter Sun and Arthur Menzies. You’ll also find Underway and Charity in the trade. Arthur Menzies is a bit larger and more vigorous and blooms earlier in my garden – usually starting around Christmas. Winter Sun is more compact and starts blooming a couple of weeks later. This group of plants sports bold, somewhat tropical looking leaves with a thick, waxy cuticle. This time of year yellow flowers emerge from the center of the plant. After the bees do their jobs of transferring the pollen around, blue fruits that resemble grapes replace the sunny flowers. Because the foliage looks a little like holly and the fruit favors a grape, some call this plant “holly grape”. 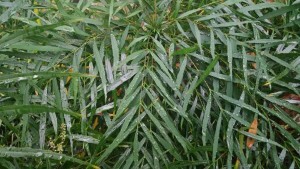 That name is probably more commonly associated with the older mahonia in the trade – Mahonia bealii. 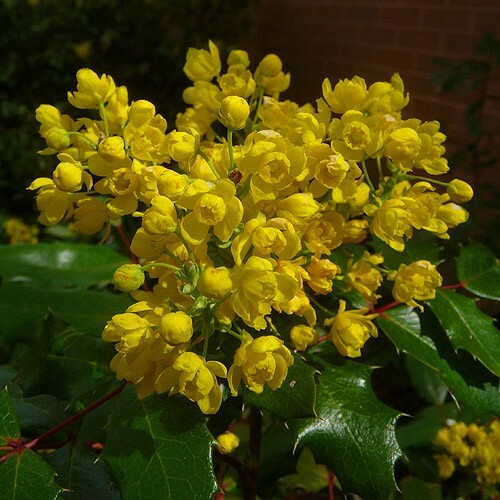 Mahonias make a bold statement in the winter garden with their interesting texture and bright yellow flowers. These plants perform best in our climate in partial shade with some protection from the worst winter winds. 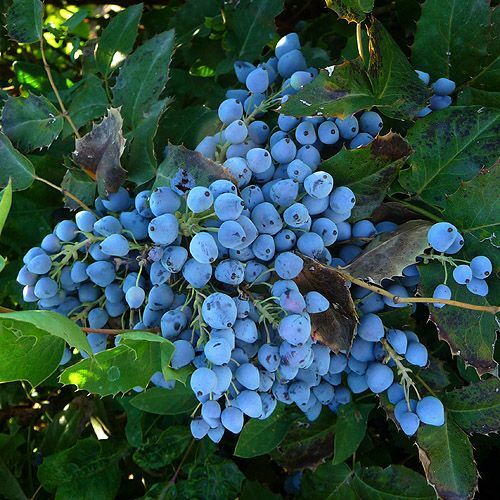 References from the Oregon and Washington often suggest that it will grow well in full sun, but our intense summer sun is a bit too much for mahonia. 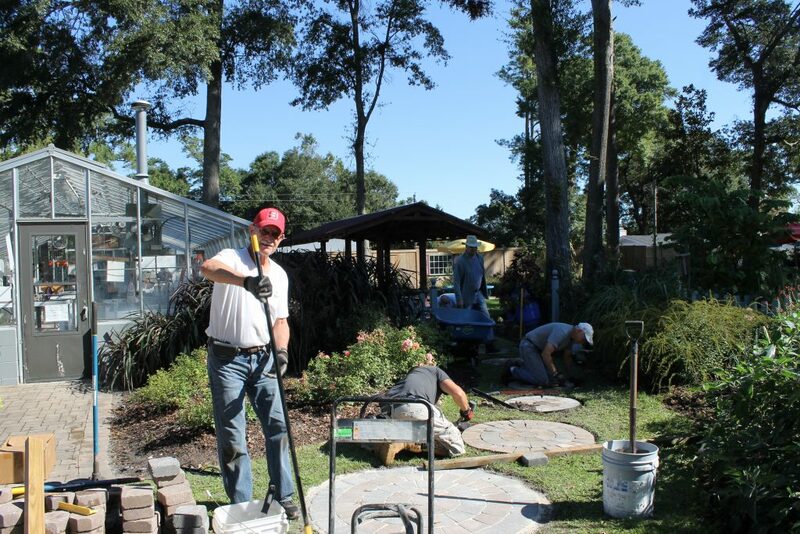 You’ll get maximum performance in moist, well-drained soil that has been supplemented with organic matter – about like you’d prepare for azaleas and camellias. After a year or so in the landscape, these mahonias should survive pretty well on natural rainfall. A completely different group of mahonias has become a garden hit in the last few years. 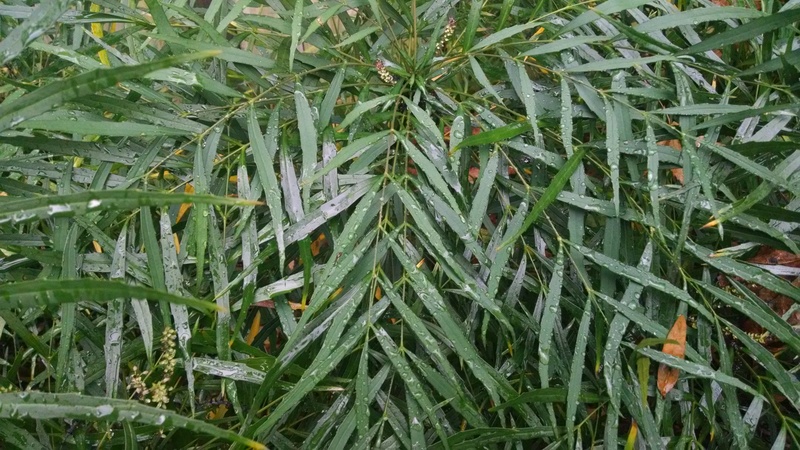 While these Mahonia eurybracteata selections sport similar yellow flowers, they are much smaller (3 to 4 feet tall and wide) and the foliage looks more like bamboo. The flowers are bit earlier making their appearance in October. The most popular of these is one from the Southern Living collection called Soft Caress and is readily available in our area. For lots of great information and advice, check out our website http://ces.ncsu.edu, where you can post your questions via the ‘Ask an Expert’ link, or contact your local Cooperative Extension center Pender County 259-1238; New Hanover County 798-7660; Brunswick County 253-2610. You can also find great local information at www.nhcarboretum.com and on Facebook. Just search for “New Hanover County Arboretum. During a class last week on of the students asked me what I considered an elegant garden. Elegance is, of course, in the eyes and mind of the individual. I have visions of graceful Japanese maples, stacked-stone retaining walls, fountains and outdoor kitchens with enough BTU’s to make Lucifer envious. All that Architectural Digest stuff is nice, but I’m a good, old southern boy who was raised way back up in the woods where the dancing was square and the harvest gold “cook stove” was inside the house. So, I started thinking about what a garden would look like done in “redneck chic”. That may sound like an oxymoron, but we may just start a new garden trend in Beverly Hills and Boca. Nothing says “redneck style” like a petunia bed encompassed in the remnants of a rear tire from your favorite ‘B’ John Deere, ‘8N’ Ford or ‘M’ Farmall tractor. The fading rubber resists the ravages of even the most poorly- operated Snapper or weed whacker. Show your patriotism by painting the garden edging red, white and blue in summer. Red and green is a nice touch during the holiday season. It’s still all about the plants, though. You’ll have to bring in the high-organic matter soil, get the pH right and use the slow-release fertilizers to keep the annual flowers happy. Show your classic taste by making sure that the flower color palette doesn’t clash with the current colors of your tractor tire. No garden for those of us who are perennially lacking in sophistication is complete without multiple references to those former dirt-track demons of NASCAR. Mark the driveway entrance with a “Dale Earnhardt Way” street sign. Soften the harsh vertical element by planting a Chinese wisteria vine at its base so you can enjoy the fragrant purple flowers in spring. After several years of growth, the wisteria will bring even more pleasure when you can break out the chain saw and beat it back into submission. If you can’t get the chain saw started, just let the wisteria keep growing. It will provide great cover for that rusting hulk of Monte Carlo in the front yard. And, since it loses its leaves in winter, you’ll be able to take advantage of seasonal dynamics in your landscape design. Spring will be awash in flowers. Thick, green foliage will dominate in summer. As fall turns to winter you’ll have the wonderful textural play of twisting, gray stems embracing the rotting, Fisher Body sheet metal. Trees are a “must” in any garden design. Southern chic demands the incorporation of at least one Chinaberry. That’s Melia azedarach if the Latin stuff turns you on. Bi-pinnately compound leaves might suggest a somewhat tropical look – especially if you’ve already had a beer or twelve. There is even a variegated leaf form, but you’ll have to prune it heavily each year to keep if from reverting to the regular green leaves. The hard, bony seeds that persist through the winter are unrivaled as “wrist rocket” ammunition. Whether your idea of elegance is a complex cabernet or getting that perfect one inch of head on a draft Bud, I hope you agree that we take ourselves WAY too seriously.. Laugh a little. It won’t bring peace to the Middle East, but it just might make you feel better.